I suppose my resorting to Taras Bulba betrays a certain nostalgia for the big clunky pleasures of early-’60s Panavision — plus, of course, it hasn’t been that long since I saw Some Like It Hot or Sweet Smell of Success, or some of the other pictures that people point to when they reflect that the former Bernard Schwartz Could Really Act: The Defiant Ones, Spartacus, The Boston Strangler. Nevertheless, it seems to me that Taras Bulba, in its way, serves as an apt summary of Tony Curtis’s entire 130-picture run, from City Across the River to David and Fatima: a pretty-good career with plenty of spectacular highlights. Students who come to Tony Curtis via film-class screenings of Some Like It Hot have a different perspective from those of us who were going to movies when Curtis was really hot. For them, his career dribbles down from Some Like It Hot; for us, it built up to it — or to The Defiant Ones (his sole Oscar nomination) or Sweet Smell (for that hardy handful who saw it at the time). My intro to Tony was George Pal’s colorfully ersatz biopic Houdini, a staple of Saturday kiddie matinees in my town during the ’50s; I must have seen it five times. Son of Ali Baba was another. I can’t say I ever heard him utter the immortal “Yondah lies the castle of my faddah” (did he really say that? Where? The Prince Who Was a Thief? The Black Shield of Falworth? ), but that’s pretty much the Tony Curtis I first met. 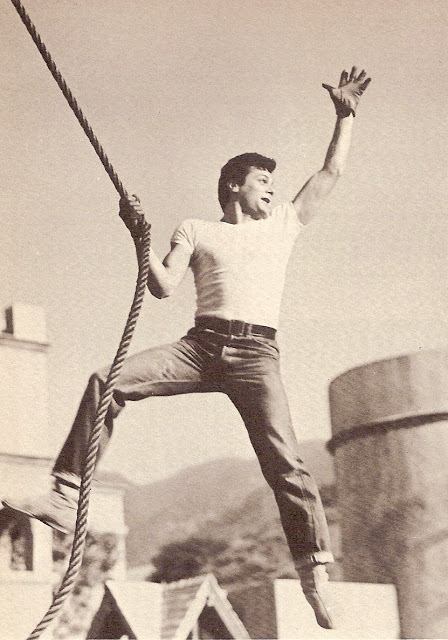 It’s the Tony Curtis of this publicity still, which was printed in a short chapter near the end of Richard Griffth and Arthur Mayer’s 1956 coffee table tome The Movies. It was part of a two-page spread headed “Teen Faves,” featuring pictures of Curtis, Tab Hunter and Guy Madison and wondering which, if any, would turn out to be more than a flash in the pan. For Curtis’s fans from those early days, this is the Tony we remember — athletic, exuberant, rambunctious. If we want to remind ourselves of what a good actor he could be, we’re as likely to think of The Great Impostor (as real-life poser Ferdinand Demara) or The Outsider (as the tragic Ira Hayes, participant-by-chance in the famous Iwo Jima flag-raising) as we are Sweet Smell of Success. And at comedy, we may say he never got the credit he deserved for Some Like It Hot, but we’re as likely to remember him for Operation Petticoat. That was the quintessential Tony: slick, even a bit shady, Bronx-street-hustler charming, fast-talking with that Noo Yawk honk, and immensely pleased with himself and what he could get away with. Which, by all accounts (including his own), is pretty much what Bernard Schwartz was like in real life.